Living Large equates to living well within your means while thoroughly enjoying those thing in life that you love. Making spending choices requires thought and consideration. Once you've made a purchase, don't be afraid to change your mind. When your money is on the line, you should be absolutely certain it's well spent. Whether its simply the wrong choice or an inferior product or service, don't be shy about asking for a refund. Yes a return usually requires the extra step of contacting, visiting, or shipping items back to the company of origin, which keeps many from requesting a refund, but protecting your hard-earned resources is worth the effort in my book. Sometimes you don't realize your purchase wasn't sound until well after the specified return timeline. Don't consider your money gone. It can often still be recouped. Case in point is my recent Quicken experience. Spending within the boundaries of your income requires you to self-monitor, which starts with budgeting. My long standing software choice for organizing my personal finances on a PC has been Quicken for Windows, made by Intuit. As a PC owner, I've relied on Quicken for over a decade to accurately help me track, budget, and simplify my finances. Options such as manual entry or automatic downloads from financial institutions, quick pictures or detailed reports of current or projected financial status, and payment reminders or automatic entry make it super customizable. 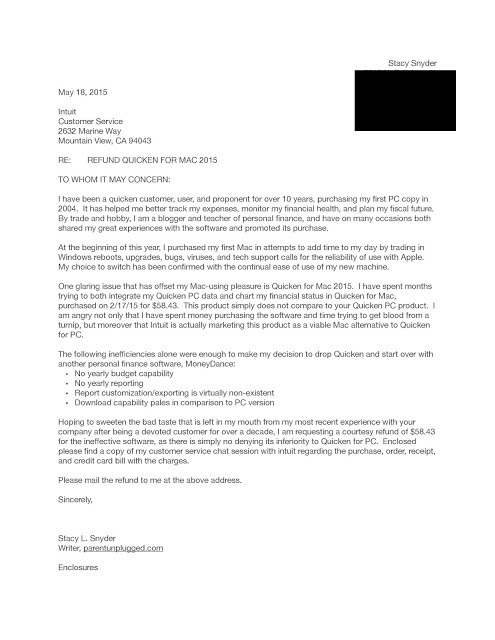 While I still recommend Quicken wholeheartedly for PC users, my purchase of Quicken for Mac proved so substandard to its PC counterpart, that I don't even think there should be a charge for it. I argued this point with Intuit recently and received a full refund of my purchase price, well outside of the 60 day refund period. It took me 20 minutes to draft the letter, 5 minutes to research the address of the corporate office and a forever stamp and walk to the mailbox to process. Completely worth the time and energy, not only for the actual money restored to me for an incompetent product, but in this case, to have my complaints and feedback ingested by the source. If you dropped three Andrew Jacksons out of your pocket while walking, you'd take the time to zig zag back on your route to look for them in the name of being a decent steward of your money. Do the same with your purchases. If the product or service is not what you want, get your money back. Otherwise you're throwing money away.